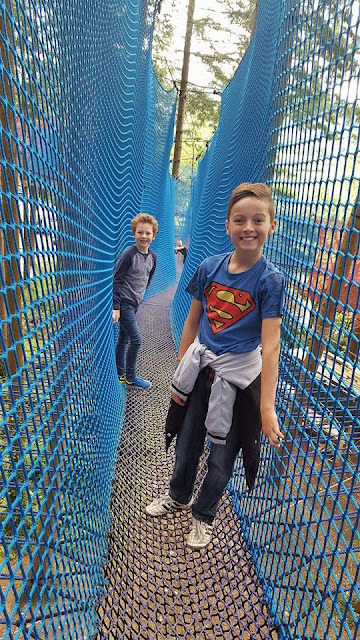 A trip to North Wales isn’t complete without a visit to Zip World!!! We sampled three of the many attractions there over the summer holidays and hopefully on our next visit will try something else. Zip World has grown so quickly, when the boys were younger we visited to see Santa in the slate caverns but since then the place has really took off. 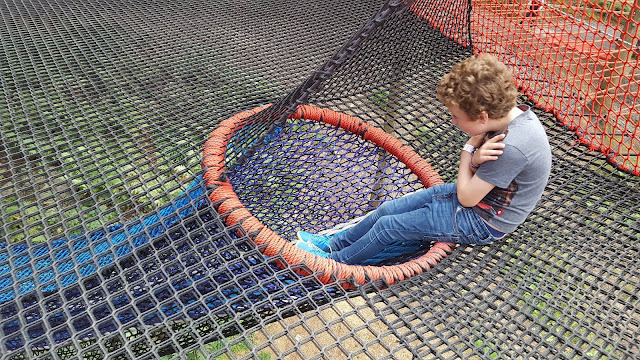 Is a vast underground trampoline in Blaenau Ffestiniog, I was a bit worried about looking down and seeing a big drop but the nets all looked very safe and secure when we were on them. Once on the nets you can get mats and go down metal slides (after a while we didn’t bother with the mats and just went down without them as we couldn’t be bothered carrying them about, you do need to move your feet a little to get enough momentum without the mat though!) you can also head off and explore the various nets in your hour slot! I thought an hour might be a bit long for me bouncing away but it went very fast. 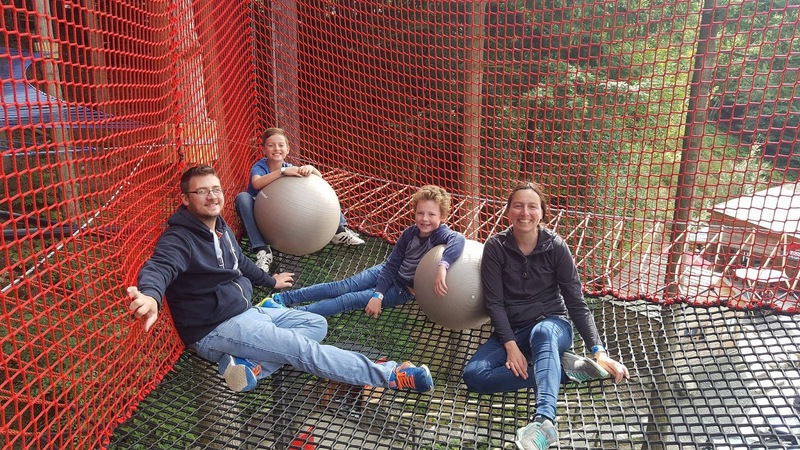 When Bounce Below first opened it had a few complaints about the overalls you had to wear which were a bit smelly from everyone jumping but now you can wear your own clothes (a long-sleeved top ideally!) thankfully!!! You wear a helmet but you have a fresh hairnet first which keeps things nice and fresh!!! When you arrive there are lockers for your possessions (£1 non-refundable). Sadly I don’t have any pictures of us wearing our helmets or bouncing on the trampolines because my phone was safely in the locker! I was worried it might fall out of my pocket with all the bouncing but feel a bit sad I didn’t have any photos of the experience. The boys are already planning a return trip but it is quite pricey our family of four was £90 so we will need to save up again!!! For an hour’s entertainment it can be considered steep I guess but it’s such a unique and interesting experience, which we will no doubt do again but maybe as a birthday treat. My husband won’t do coasters of any shape or form so I was nominated to take youngest around the track at the Betws-y-Coed Zip World. If you’re under 9 you have to go with an adult or a child over 9, so I guess I could have asked my eldest who is 10 to ride with my youngest but I can’t trust them not to squabble ALL the way round!!! I am so glad I went on it though you have three goes for £30 (if you are sharing with an under 9) or £20 if your riding solo and with each turn round the track youngest and I got braver and braver! On our second go youngest was demanding I go faster. By the third-time round we were zooming down!!! It’s easy to speed up and break the controls are very simple to understand, you can see signs letting you know when to brake too so it’s all quite self-explanatory! In-between goes you queue up again but the slot times are very well managed so we didn’t wait long even with it being the summer holidays. I wasn’t so keen on the uplift in the beginning but you soon relax and enjoy the woodland views. You can go as fast as 25 miles an hour but it seemed so much faster! My eyes would water on the way down! Before I went on I thought people were randomly crying but then realised what was going on when it happened to me! If you liked bounce below then you will probably love the treetop nets, but the difference is you get to go on them for two hours so you can take your time and get the most out of them. We had a 10% discount because we had already pre-booked the Fforest Coaster, so it was £18 each instead of £20. 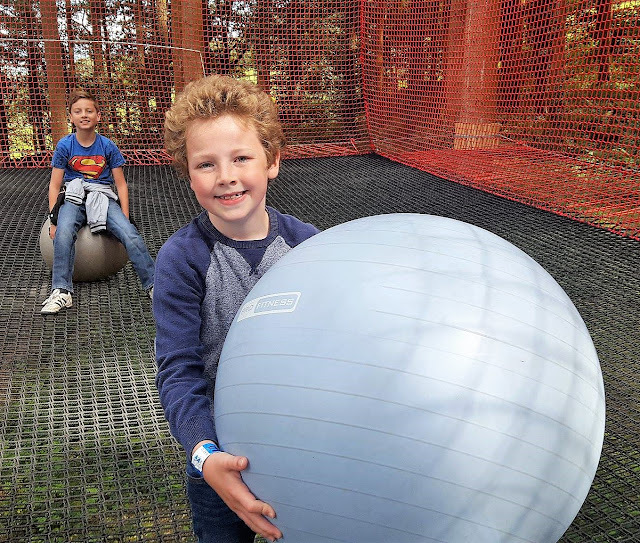 The boys liked the big balls and played dodge ball and football with other children so it was nice and social for them. I liked the net slides to go down, just make sure you cross your arms so you just catch your fingers in the net. The guy who did the safety talk was very friendly and bubbly, you can see that Zip World take your welfare seriously but like you to have lots of fun too. We were given tape to cover our rings so not to damage the nets and told a complicated list of moves we couldn’t do on the trampoline. I understand why though as there isn’t a huge amount of bounce to the nets, the boys managed to do a seat drop but I couldn’t!!! I just ended up sat on my bottom on the net. Anyway if you get the chance please do visit Zip World and see what adventure awaits you!!! Lovely to read your experience! I would love to go but will have to wait until our 3 year old is a bit older! Looks like a place the girls would like to visit next time we are in Wales!